I love hair products with argan oil in them and an increasing amount of hair companies are putting them in their products, so it must not just be me. 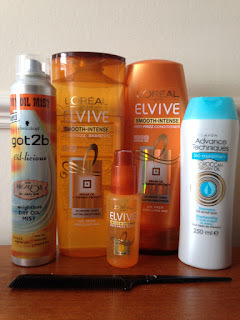 They are one of the best products I have tried to make my hair softer and shinier. L'Oreal Elvive Smooth Intense Anti-Frizz Shampoo and L'Oreal Elvive Smooth Intense Conditioner both contain argan oil in them. They are awesome and my hair feels so smooth and soft afterwards. This has to be one of the best shampoo and conditioners' I have tried. There is also a L'Oreal Elvive Smooth Intense Anti-Frizz Serum which goes along with the shampoo and conditioner, which adds a finishing soft touch. It smooth's out frizz along the entire length of the hair, with its anti-frizz and anti-volume actions Elvive smooth intense provides a long lasting intense provides a long lasting smooth result that resists humidity. This helps to prevent frizz, waves or volume to return during the day. Finally the last product I have which has argan oil in it, is got2b Oil-Licious Dry Oil Mist. Once applied you will see and instant shine and it will feel softer straight away.